The little white dog turned in to the Belfast Police Department on Christmas Day will stay with the family that took it in while officials searched for her original owner. 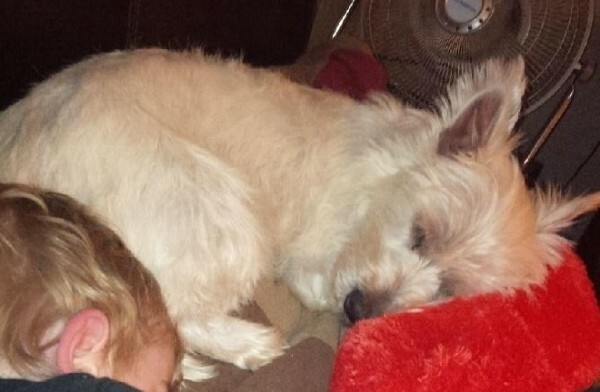 Here, Jasmine the Westie snuggles with three-year-old Michael Mushrall, the son of her new owner. BELFAST, Maine — On Christmas Day, a woman came to the Belfast Police Department with a well-kept little white dog she said she had found running around in the bitterly cold streets near the First Church. Officers found kind local folks to foster the dog while they searched for its owner. After the dog’s story had gone viral, they received queries and emails from all over the world, with nearly 200 people calling Waldo County dispatchers in one day alone. Offers came from as far as Italy and Florida to adopt the dog. The story has a happy ending, according to Sgt. John Gibbs, but not without some unexpected twists and turns. One of the 50,000 people who saw the dog’s photo was a woman from Ellsworth who called police to say she recently had given away a dog who looked a lot like that one. Jasmine, a West Highland terrier, hadn’t worked out in her home because the pet had nipped the woman’s 18-month-old a couple of times, she told Gibbs. The woman advertised the dog on Facebook and eventually met a Waldo County woman for a dog hand-off on Christmas morning at the Bucksport McDonald’s. “The lady in Ellsworth felt good about it. The home Jasmine was going to had an older child. Everything was awesome,” Gibbs said. But that’s not quite how it worked out. The Waldo County woman lost power and heat in the storm, and her household included another small dog and a cat. Gibbs said he got in touch with the Waldo County woman recently on the phone and she cried as she told him what happened next. The woman, whom he did not name, was the one who brought Jasmine to the police station and said she had found it running around. “She was stressed out. She told her husband she took it to the pound. She abandoned the dog,” he said. Police talked over what the woman did and determined she committed no crime. She had brought the dog to a safe, warm place, and although she did not tell police the truth about where she had found it, her subterfuge did not meet the standards for the charge of making a false report, Gibbs said. Although that solved the mystery of where Jasmine the Westie had come from that cold Christmas Day, it didn’t fix the problem of where she would end up. Liz Daggett, a Waldo County police dispatcher who lives in Belfast and has two children as well as other animals, had taken Jasmine in while police searched for its owner. Daggett said Thursday that she’s thrilled to provide Jasmine a “forever” home.